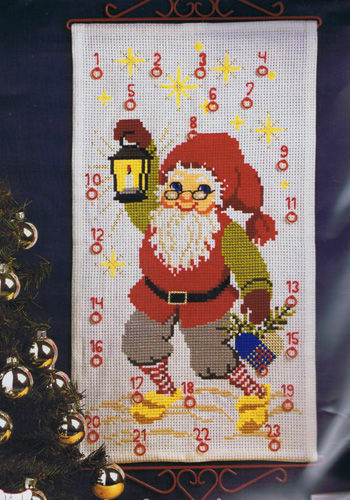 A jolly elf with a lantern and parcel in a brightly coloured advent calendar, adds fun to the wait for Christmas. The kit has a large scale black and white chart, printed 10 stitches to one inch with key on an A3 sheet. The pattern is worked in whole cross stitch and a little backstitch using 13 shades of stranded cottons. The stitch count is 80 by 140. The red heart hangers illustrated are not included but can be found in our Supplies and Accessories section. A pair of 35 cm hangers were used with the original.